What are some official settings worth getting into? The Campaign Builders' Guild > Forum > The Works > The Dragon's Den > What are some official settings worth getting into? Just as the title says. I asked about Forgotten Realms in the Tavern, but I thought I would ask this question. It can be any published material, wither it's First party, or third party setting. I'm just looking for settings that are well fleshed out, or contain interesting ideas. Re: What are some official settings worth getting into? My favourite setting by TSR/Wizards is Planescape. It's very well fleshed-out, and has some of the most detailed and well-written supplements/setting books I've ever seen. 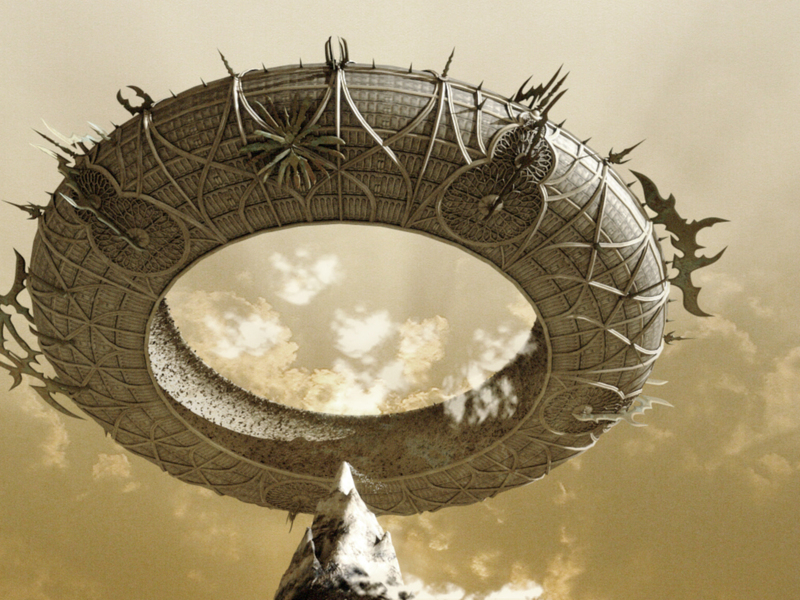 It has a really unique central city (Sigil, shaped like a torus atop an infinite spire) and takes various D&D concepts like Alignment and really elevates them. There's a philosophical tenor to a lot of it that I really enjoy, too; the factions that form the political centre of the setting all have unusual philosophical viewpoints influenced by lots of real-world metaphysical and ethical positions. The art for the setting was mostly done by Tony DiTerlizzi, who is really talented and gave the setting a really distinctive visual style. It also has one of the best video game adaptations around. I once heard Planescape described as a giant pizza with an ice cream cone on top of it, and a donut on top of the ice cream cone. Seriously though, I need to catch up on Planescape. From what I've read I love it. I began reading Well of Worlds. Yeah, it's definitely a "maximalist" setting - baroque, excessive, over-the-top. But even though it has everything in it, it feels surprisingly cohesive. It reminds me a lot of Neil Gaiman's mythological stuff, like Sandman and American Gods. Sigil, the main city, feels like it owes more to Dickens than Tolkien. Well of Worlds is pretty good. I really like The Eternal Boundary, which is set mostly in the Hive, Sigil's demon-infested slums and involves some of the best factions: the gloomy nihilists of the Bleak Cabal, the vaguely Gnostic, quasi-Buddhist death cult known as the Dustmen, the punk-anarchist-death-metal Doomguard, and the surreal lunatics called Xaositects. I feel like if you like the genre, "The Legend of the Five Rings" has a lot of story and development. I'm not super big on it myself, but I know a ton of people who absolutely love it. Were there ever any novels based on Planescape? I've been reading some of the setting materials and have really wanted to use it instead of fussing with my own setting for a while. Were there ever any novels based on Planescape? I think there are, but I never read them. There's one called Pages of Pain that's supposed to be pretty good. I don't think it's "canon," though. The game has as much text as many novels. I ran a Planescape game using Pathfinder for 3 years or so - it was a blast. Sigil is an amazing concept for a city, with every door a portal. Whole sessions of that game were spent on weird pub-crawls and tracking down bizarre keys. A big arc of the game involved the party getting arrested and having to navigate the intricate legal system of the city, complete with hiring a lawyer and collecting exculpatory evidence. The setting is so rich that just doing ordinary things and exploring the place is a lot of fun. That sounds amazing! Was it hard to convert old material to PF, and if so, do you think it would be hard to run with 5e? I can't get them back to 3.x/PF. I've tried. Was it hard to convert old material to PF, and if so, do you think it would be hard to run with 5e? I can't get them back to 3.x/PF. I've tried. I didn't do a ton of direct conversion, but even when I did, no, it was incredibly easy, since almost everything in Planescape has been statted in Pathfinder or there's an easy substitution to make. I think it would be doable in 5E. There might be slightly fewer ready-made player races and monsters, but those are also easier to make in 5e, actually, and power imbalance problems might actually be minimized compared to Pathfinder. Alternatively, if you're looking for something more like a toned-down Forgotten Realms, you could look into Greyhawk. It's the "default" setting from 3rd Edition D&D (and I think also of 2nd Edition), and it has a pretty cool map. It's not official but some time ago "Fire and Dust" was recommended to me - worth a look (http://planewalker.com/wings/archive/firedust.html). I never played Planescape in 2e and I only restarted RPGing recently, but I'm planning to use it next campaign. Personally my favourite setting was Birthright, which even if you completely ignore the realm rules was an inspired setting. I had mixed feelings about Spelljammer - the concept was great but the execution was flawed. I'm not familiar with the other two settings you mention, Tardigrade, but I did try out Birthright for a brief time. Enjoyed it quite a bit. I don't really remember the exact reason why I moved on to other things so quickly.